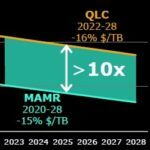 This post’s graphic comes from a chart that WDC used on October 11 when introducing its new MAMR head technology, which the company expects to propel HDD capacities up, and HDD price per terabyte down, for a number of years. 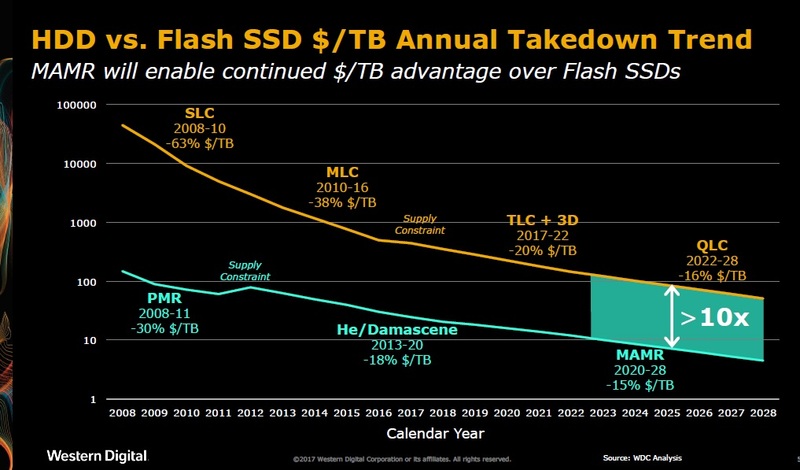 To create this chart WDC’s HDD team joined forces with the SanDisk flash team to project both HDD and NAND price per terabyte for the next 11 years. The most important conclusion is that prices (with the exception of unpredictable market shortages and oversupplies) should maintain a 10:1 price gap right through 2028. The chart shows, on a semi-logarithmic scale, that HDD prices (lower line) are on a trajectory that is roughly parallel to that of NAND flash (upper line). WDC doesn’t see them crossing through 2028, and anticipates for prices to maintain a 10:1 difference through the end of the chart. I suspect that they didn’t go any farther than 2028 simply because it’s awfully difficult to predict what’s going to happen that far out. Still, the company believes that it has a good idea about how things will go up to that point. 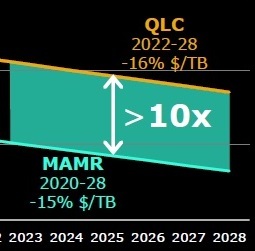 I would expect for many readers to wonder what MAMR is, along with the other HDD-unique buzzwords on this diagram. MAMR is WDC’s new “Microwave-Assisted Magnetic Recording” technology. By building a tiny spin-tunneling oscillator within the HDD’s magnetic head WDC can force the energy in the head high enough to record bits onto the disk even though current is limited by the shrinking geometry of the head itself. Without this you couldn’t get enough current through the head to flip bits on the disk. You can’t build a spin-tunneling oscillator into the head using conventional head manufacturing techniques (Ion Milling) so WDC is able to profit from a change the company made some years ago in harnessing a proven semiconductor manufacturing technique called Damascene Etch to produce its heads. Helium (“He” in the periodic table) has a much lower density than air, and WDC’s conversion to helium-based HDDs allowed it to place tracks more densely on the disk, and to fit more disks to an HDD’s package, since the disk flutters less and the head moves more precisely. PMR — Perpendicular Magnetic Recording — is a technique that brought HDDs to higher capacity levels about a decade ago. The HDD market can measure its progress using a steady series of breakthroughs as mileposts. Just when it looks like HDD makers won’t be able to fit any more terabytes into a package some new technology comes along to significantly boost capacity once more. PMR and Helium are two of these milestones, and MAMR is the next one. Don’t be surprised if more such innovations take HDD technology well beyond 2028. An amusing note: The SSD Guy finds that it’s only fitting that WDC has developed a spinning head to read its spinning disks. My company Objective Analysis keeps abreast of new technologies that could impact the outcome of the SSD market, and we help our clients to understand what will happen in the future and what they must do to excel in tomorrow’s environment. We welcome the opportunity to work with companies who plan to succeed. Please visit the Objective Analysis website for a better understanding of how our company can help yours.